For more than 10 years, Comble Property Management has proudly served clients throughout Seattle’s Eastside. 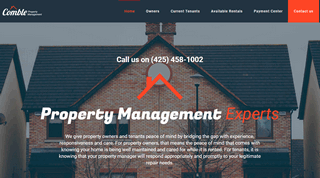 We’ve worked hard to build our stellar reputation, but our goal remains simple and focused: our property management team is dedicated to do our absolute very best in managing our clients properties. We accomplish this through personalized and professional service, highly knowledgeable associates, close and personalized relationships with tenants, owners & our vendors.